Can I buy just your shades? Can I mix and match bases and shades? Do you offer optional finishes? Are the products flame retardant? Are they safe? What is the difference between a rental and a purchase? Where can I use lamps in a restaurant? Where can I use lamps at home? Q: How do the lamps work? Our lamps work several ways and it is best to decide at the beginning the type of light you want to use because the lamp parts and wire framing of the shades is different depending on the way we make them. The "C" lamps have a pegged votive glass insert and the underneath fittings of these shades are made to specifically fit over our pegged votive glass. 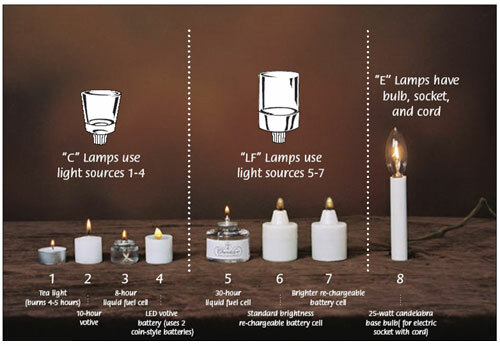 "C" lamps can use tea light or 10-hour votive candles, an 8-hour fuel cell or a flicker votive battery cell. A larger fuel cell or a re-chargeable battery system will not fit into the glass insert on the "C" lamps. The advantage of "C" lamps is that the shades can be made smaller, as with our mini lamp styles, so you get a wide offering of styles and sizes with this version. "LF" or larger fuel lamps have a larger glass cylinder insert under the shade and the wire framing of the shade is made differently than the "C" version. You can use a 30-hour fuel cell with this or a re-chargeable battery cell. This is typically what a restaurant or club will prefer. You would also enjoy this in your own home because you don’t have to change out candles or oil cells so frequently. If you are buying this type and later want to use it with just a candle, you can put a flat bottom votive glass with a candle into this set-up. "E" lamps are actually electric... they typically have an 8' cord with a switch on the cord, the shade has a clip that clips on to a candelabra electric bulb, and they are shipped with a 25-watt candelabra bulb. Obviously most restaurants want the candle, battery or liquid fuel version, but occasionally a restaurant will want a brighter, steady light and will wire their dining rooms for electric table lamps. Sometimes they will use electric around the perimeter of the room and fill in the center tables with matching fuel or battery lamps (I think we are the only company that can offer that where they all match!) Of course electric lamps will always be popular in a home setting. Attention all restaurants and monthly fuel users… be sure to ask about our fuel saver program. Sign up for 3 monthly shipments of fuel and receive 5% additional discount on your fuel purchases (must receive at least 3 cases per month). For purchase orders of 6 months or more (monthly shipments) you can figure an additional discount. Click here to submit a request to be entered on the fuel saver program. Q: Can I buy just your shades? People know Chandelyn lamps by the workmanship in our shades… they are truly beautiful and set us apart and we are frequently asked this question. Our C or LF shades are made to work on our lamps only- they are manufactured to fit our parts only. If you want to buy just our shades we sell any of our "C" candle shades packaged with our pegged votive glass and 3 different sizes of rubber bushings, and that is called a "candle shade kit". By firmly attaching our candle shade kit into your own candlestick you can make a candle lamp assuming the proportions are appropriate. Our mini shades typically fit on candlesticks 6 ½" to 7" H and our standard shades typically fit on a candlestick 7 ½" to 8 ½" H. Bases of candlesticks need to be large and heavy enough so the lamp will not be top heavy, and customer is responsible for making sure the shade kit properly affixes to the top of candlestick. Chandelyn quality insures that fabric shades are handsewn out of flame-retardant fabrics. We also offer our shades in an electric version with a candelabra clip that clips onto a standard chandelier candelabra base bulb. You can purchase just our shades made in this way to fit on your own chandeliers or wall sconces. Our electric shades come in two sizes: mini ( 3 1/4" top x 5" bottom x 4"H ) or our drum size: (3 1/2" top x 6 1/2" bottom x 4 1/2"H). We can also make electric shades in your own fabric sewing it on our frames- this is an option popular with designers! Hotel Replacement Electric Shades… this is a large market and we offer many styles of hardback shades with different mounts, fabrics, etc. Please let us know what you are looking for and we would love to give you a quote- we need quantity, size, fabric and type of mount. Q: Can I mix and match bases and shades? The only other question we will ask you in writing your stock # or placing your order online is to designate the beginning prefix # of the lamp with C, LF, or E to tell us what type of glass insert you want in your lamp(according to the type of light you want to use on a C or LF lamp) or specify E if you want your lamp electric with cord, etc. Q: How do I get replacement parts? We have replacement parts in stock for our lamps. Almost all parts can be ordered individually for any of your needs- just let us know. We have some customers that have bought from us for 20 years still buying the same replacement parts for their lamps, and updating lamp styles as they go along, or just buying new shade styles to update their look. Whether it's glass inserts, replacement shades or bases, or just a little part here and there, we should be able to accommodate your request. Table Decor offers you continuity and a company with longevity that stands behind their products! When comparing our products with an imported "gifty" type of candle lamp, this is an important feature to remember! Q: Do you offer optional finishes? We do offer other finishes besides what you see on our product pages… for commercial quantity orders we offer different plated finishes such as satin pewter, nickel, antique brass or bronze. We also do handpainted faux finishes that offer many effects. For example, the Luxor Hotel in Las Vegas liked our swan base but we custom finished it by matching their mahogany woodwork on the lamp base and then adding an antique gold finish and a sleek gloss black on the urn with antique gold accents- very sophisticated! Please let us know your requests and we will try to accommodate them. We are working on an order right now where we are handpainting the center column of the lamp base to match a customer's china pattern. Q: Do you offer custom work? For quantity orders, besides the optional finishes and handpainting we offer, we can also customize your lamp with different fabrics and trims, or even custom shapes. We have made custom bases for Bellagio; we have taken an early 1900's oil lamp from Mohonk Mountain Lodge in NY and updated/adapted it to use in their banquet hall; it now holds a standard 30-hour fuel cell, has a table number holder and vase all in one piece! We have created leopard spotted and zebra striped shades for a zoo event… the possibilities are endless and we look forward to working with you to create that special effect! Q: Are the products flame retardant? Are they safe? Our handsewn shades are made out of flame-retardant fabrics and trims that pass commercial fire code NFPA 701. Chandelyn lamps are designed so the flame is always encased in a heat-resistant glass, and the lamp bases are sized so they are a proper base diameter and heavy enough so the lamp is very stable and not top heavy. However, all manufacturers of candle products have to say…" as with all candles, a flame is present; therefore use with care. Do not leave your lighted lamp unattended." Not for use with children. Q: What is the difference between a rental and a purchase? All of our product line is for sale, and we also rent a few styles for your special event! Our Events To Go Collection is available for rental. You can download a rental form for pricing and terms. We ship nationwide on a rental basis and the lamps truly offer a unique centerpiece, whether for your wedding or for a special birthday party, or as a stunning centerpiece at a corporate event. Q: Where can I use lamps in a restaurant? Our lamps were designed for restaurant dining room tables, which explains the height being under 13" on most lamps so you can see over them! However, this height also looks nice in groupings on a large banquet table, or on a bar, or on "two tops" in a bar area to create an intimate setting.. We also have larger candelabra style pieces and buffet lamps that look stunning in a banquet room, or any of our lamps with extender poles will also be tall enough for a banquet room- tall enough to make an elegant statement in the room, and tall enough so the customer seated at a banquet table can see under them and not have a centerpiece blocking their view. Q: Where can I use lamps at home? On our hang tag packaged with the lamp we describe our lighting as "elegant, romantic lighting for use throughout your home…" and then we list several places someone would put a Chandelyn candle lamp: Dining room tables…on a desk or secretary… buffets… mantels… porch… by the jacuzzi… in an outdoor garden setting…anywhere you don't want a cord and plug for a light! Of course our electric lamps are perfect for many areas… dressing room tables, on a bookshelf, as an accent light in any area where you need a brighter light and have an outlet.